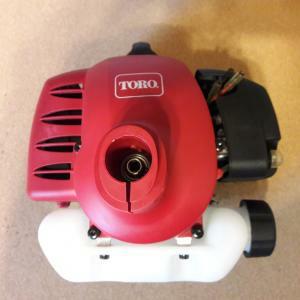 Toro 25.4 cc Two Cycle Trimmer Engine / Power Head. Working Speed up to 7,780 rpm's. 50:1. It is 50 parts gasoline to 1 part two-cycle oil. Mix 1 gallon of fuel with 2.6 ounces of oil to operate the engine at the optimum lubrication in the fuel system. Option: You may want to mix the First gallon of mix at a 40 to 1 ratio for the break in. Use 3.2 ounces of two cycle oil to one gallon of fuel. These are Brand New engines.